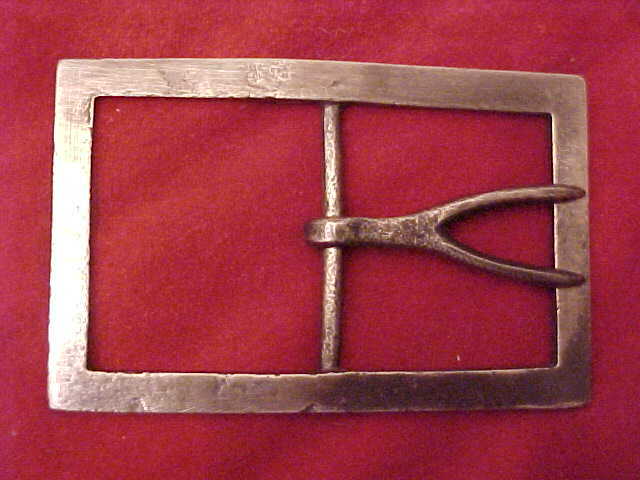 Confederate Frame and Forked Tongue Belt Plates. 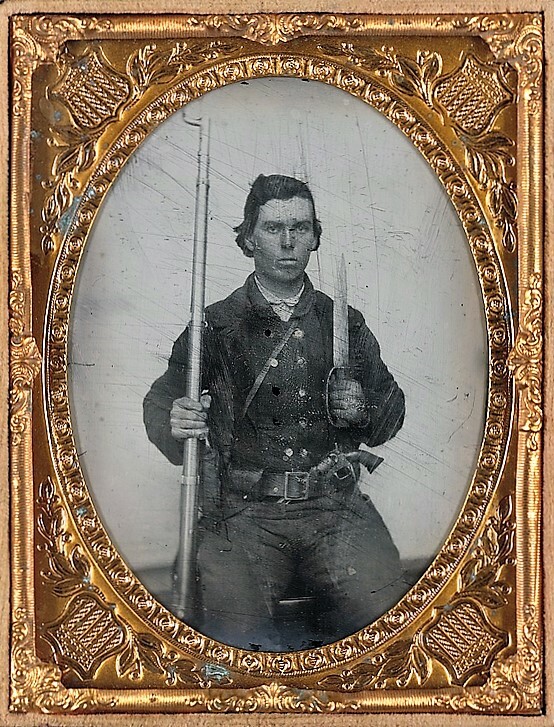 Confederate wearing a Frame belt plate. 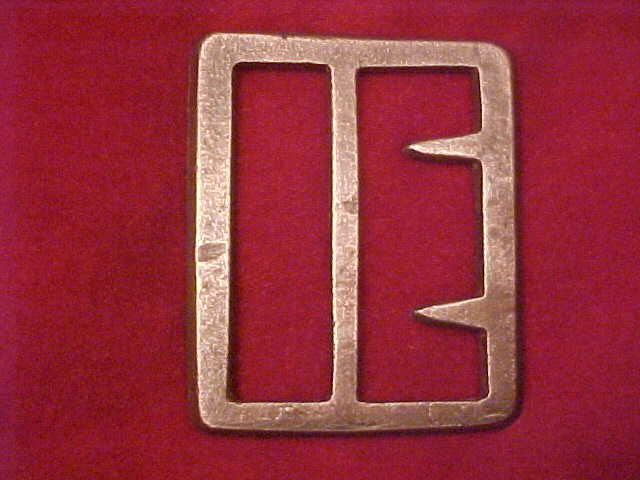 This type belt plate was called Georgia but used by most all Confederate states. Relic hunters gave it the name Georgia Frame. 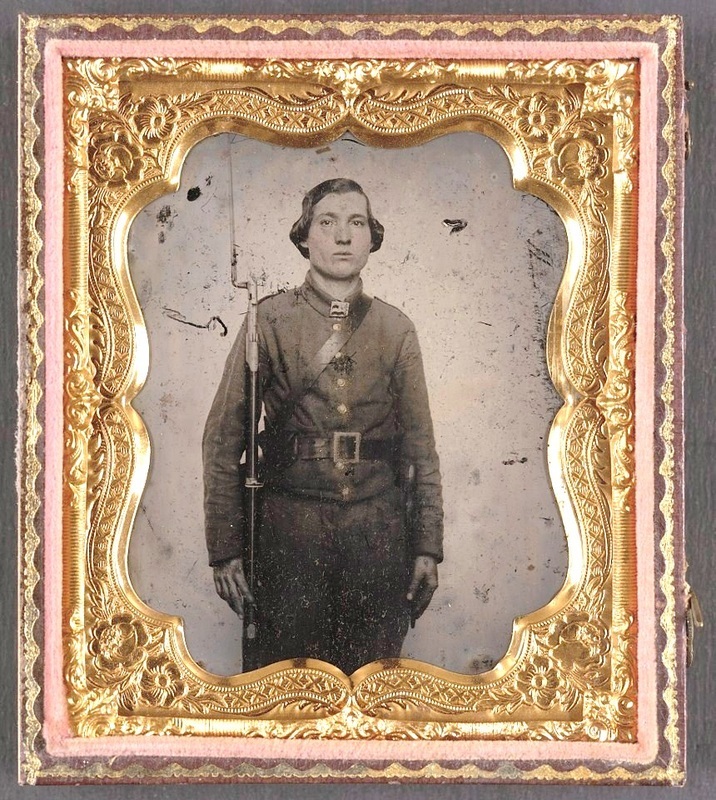 Photo above and below shows a Confederate wearing a Forked Tongue belt plate. 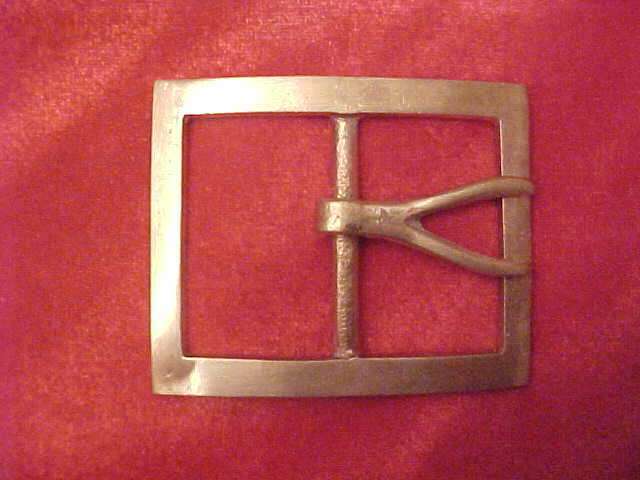 Like the Frame this type belt plate was very useful and could out last most other buckles. 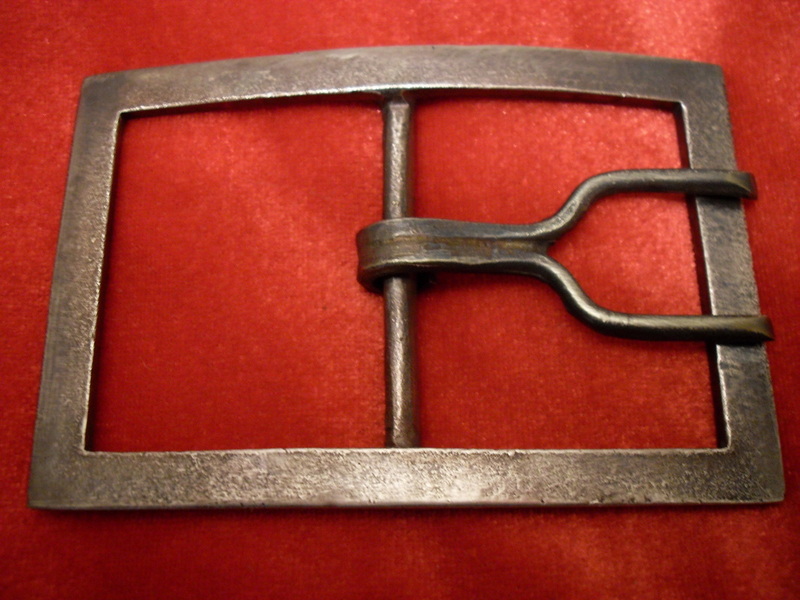 TG -McELROY & HUNT Confederate Frame Buckle Marked "McELROY & HUNT - MACON, GA." circa 1861 - 1865 Original Dug - Cold Harbor, VA. Stamped in the master pattern and cast into the Frame McElroy & Hunt - Macon, GA. 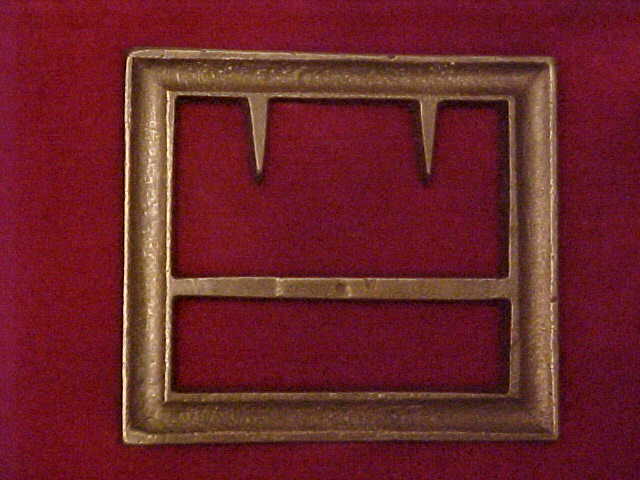 If it is stamped into the Frame after it is cast don't be fooled. Confederate Frames and CSA Belt Plate I dug from the Cold Harbor battlefield. Also leather shoe and buttons with cloth. T-75 Gutter Frame back view. They cut the gutter in the back of the Frame to save brass and weight. One of the most common Frames. TG-75 Gutter Frame(screwhead). Circa 1861-1865. RARE. They attached these master patterns to a board with screws and the screwhead shows on the back after each were sand cast. 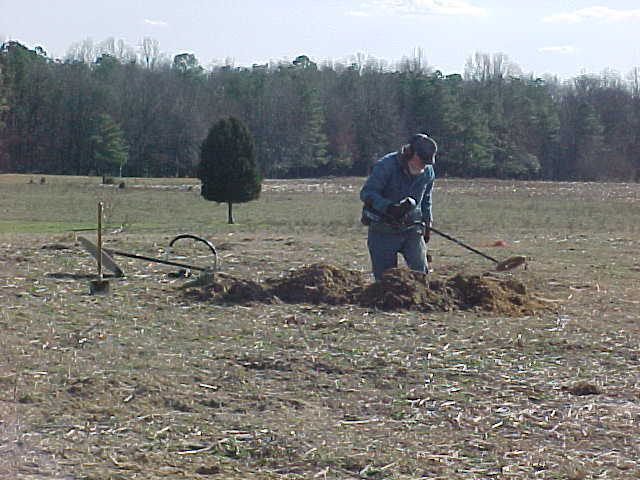 Charles Burnette was digging and I was using the twenty-two inch search coil trying to follow the Cold Harbor Confederate trench line across the field and down about waist deep we found this Confederate Frame. Has remains of the leather belt. 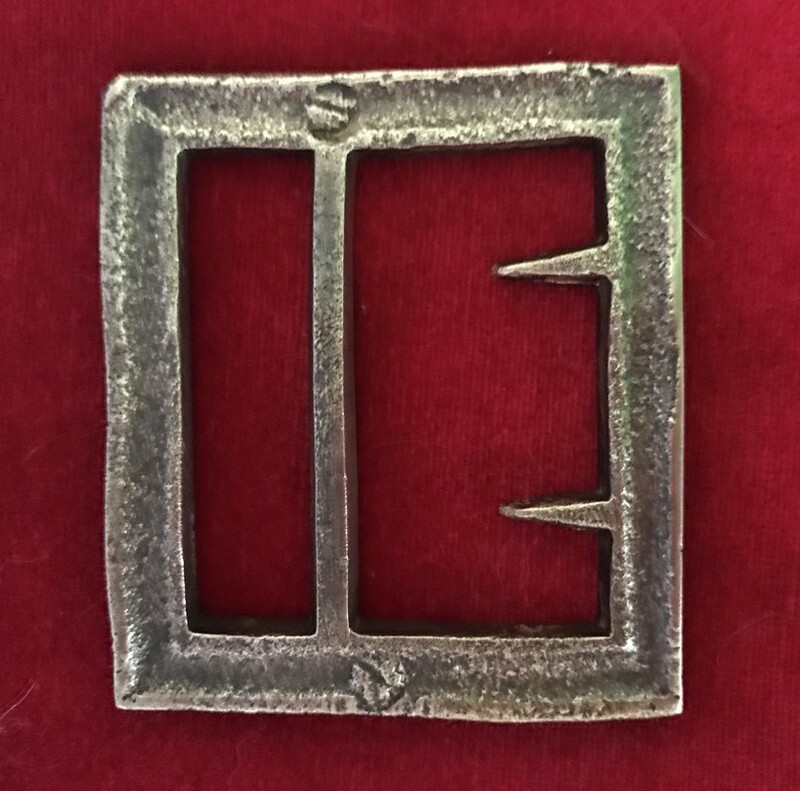 T-78 - Large Forked Tongue Belt Plate Circa 1861-1865 Original found Cold Harbor, VA.
Louisiana Confederates wearing Forked Tongue Belt Plates. Well made belt plates. 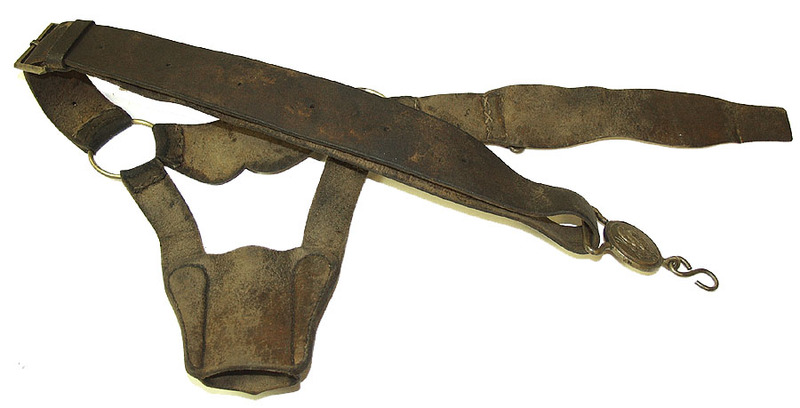 The Forked Tongue and the Frame belt plates were used by all Confederate States. 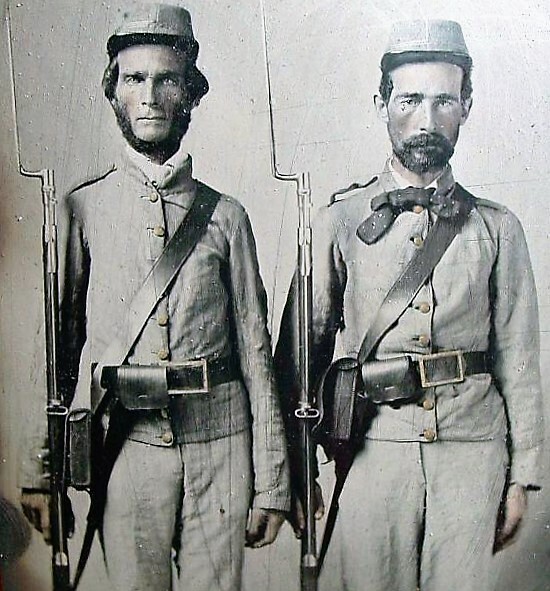 It is called the Georgia Frame but got its name because many were dug from Georgia camps and battle sites but the photo above shows two Louisiana Confederates wearing the Forked Tongue. 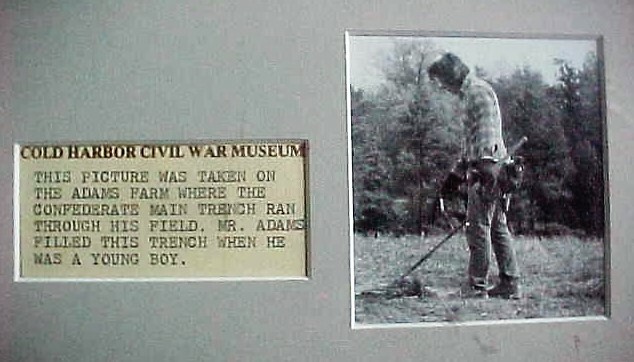 TG- Medium size Forked Tongue Belt Plate Original dug Cold Harbor, Va.
Charles Burnette digging in the field Cold Harbor confederate trench line where we dug the Frame. The big search coil was really new to relic hunting in the early days. 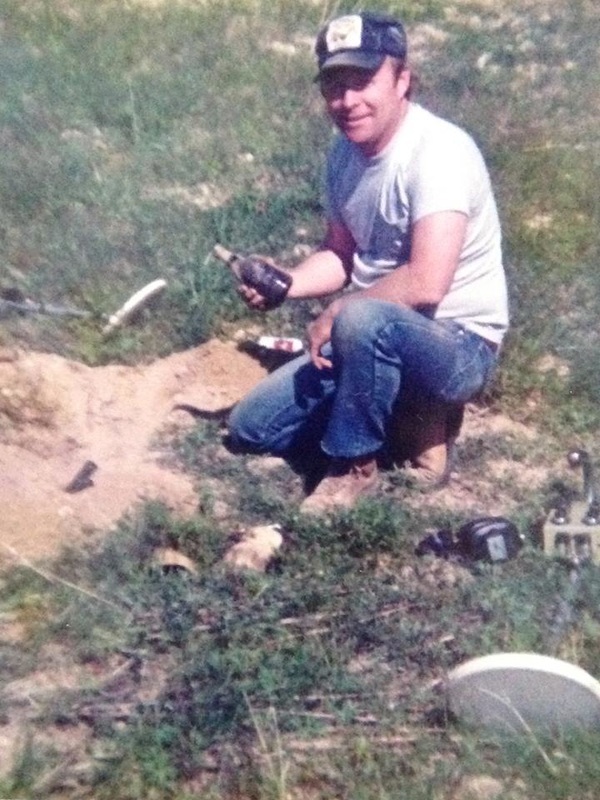 I am digging a relic that will probably be at the bottom of the trench or maybe a hut site. It took the custom metal detector to find these deep relics. G-37 Small Forked Tongue Belt Plate Original dug Malvern Hill,Va. 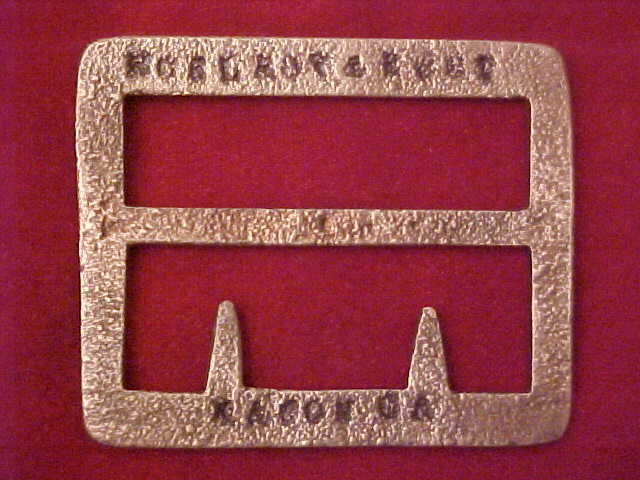 Original Forked Tongue Belt Plate dug from the 1864 Cold Harbor battlefield. Double Tongue Frame. The original was dug at Gaines Mill, VA. battlefield. 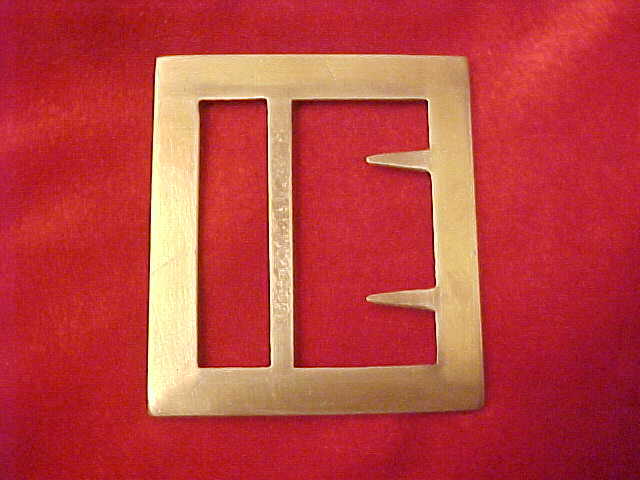 Rare belt plate. Only dug two of this type in all the years I been relic hunting. 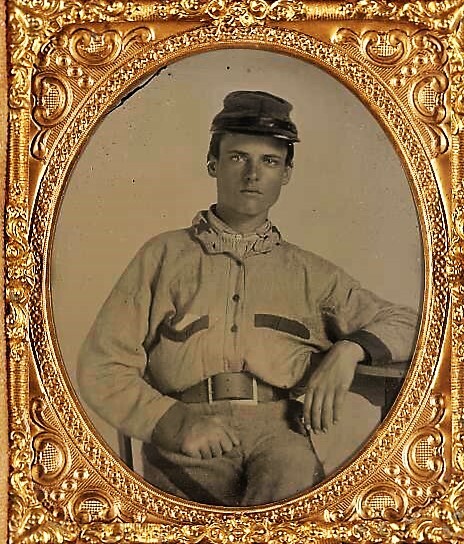 Confederate wearing a common type Frame Belt Plate. He was well dressed early in the war. G-38 Confederate Frame Belt Plate original dug Petersburg "Rebel" Trench Line. TG-76A Confederate Frame Belt Plate original dug TN. battlefield. T-79 Confederate Frame Belt Plate original dug Glendale, Va. battlefield. 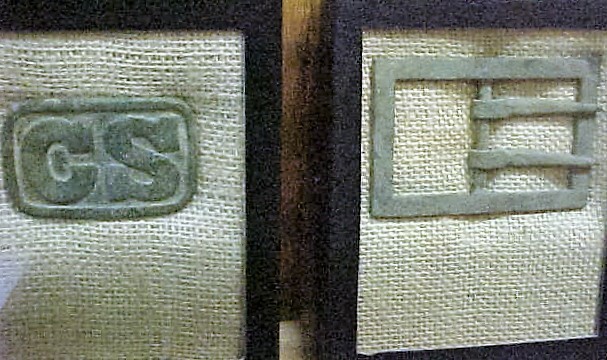 The Frame belt plate on the left was made to be used as a screwdriver. Dug from a Richmond, VA. Confederate campsite. 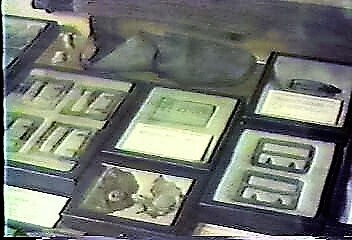 Forket Tongue on original leather belt and Confederate Cap Box displayed in my Cold Harbor Museum. TG-78 Double Tongue Frame Belt Plate. 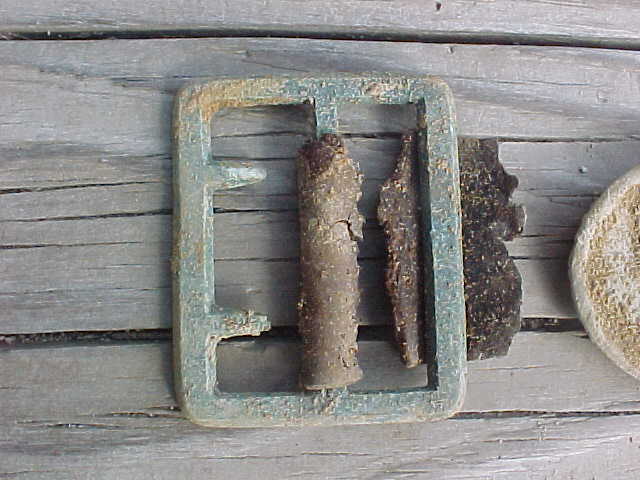 Original dug Malvern Hill, Va.
1832 NCO belt and buckle with the type adjustment buckle used as a belt plate by the Confederate in the picture on the right. 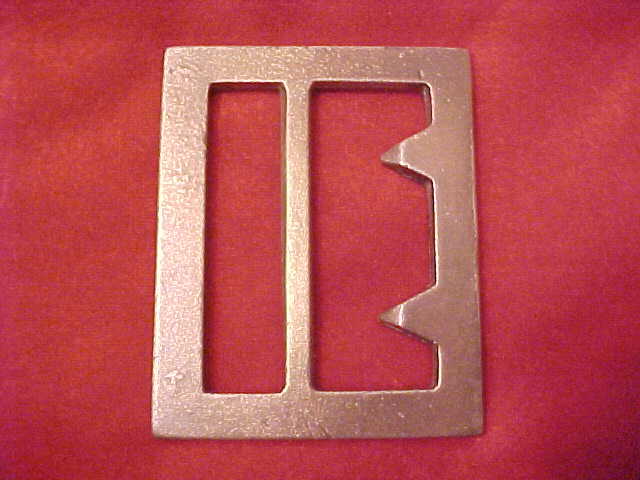 TG-76 Confederate Frame Belt Plate. 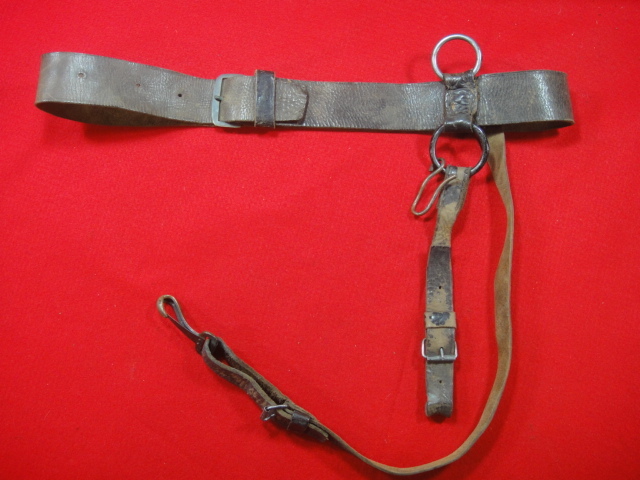 Original dug Gaines Mill (seven days battle) Va.
Belt rig with sword hangers using the adjustment buckle. 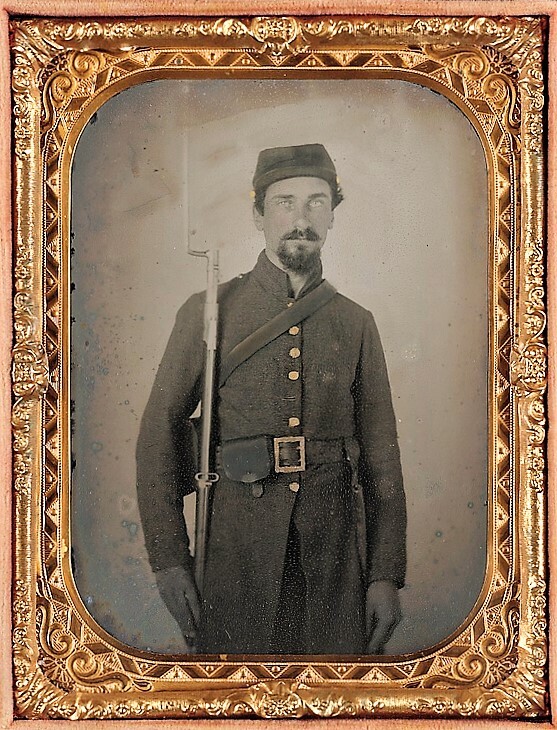 Note the buckle this Confederate is wearing. 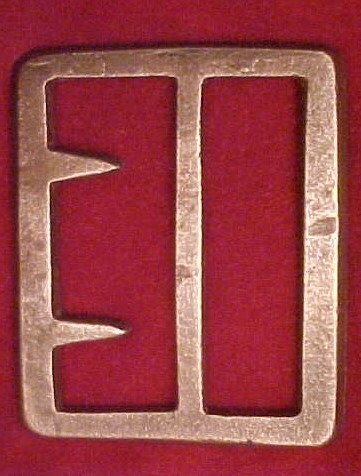 A belt adjustment buckle used as a waist belt plate. 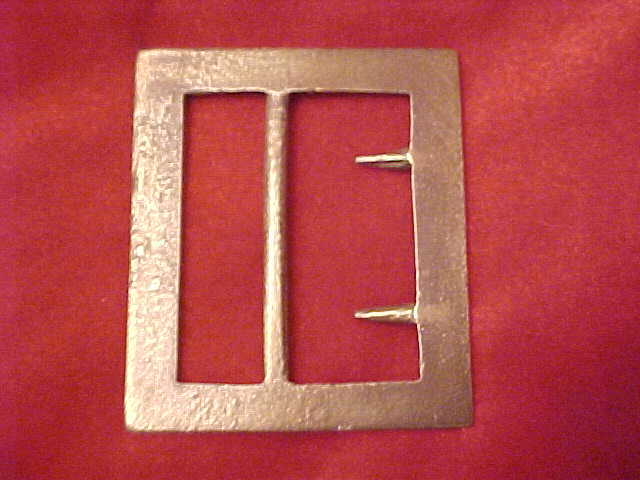 TG-AB Confederate Used Belt Plate Small buckle 1 3/4 tall 1" across. 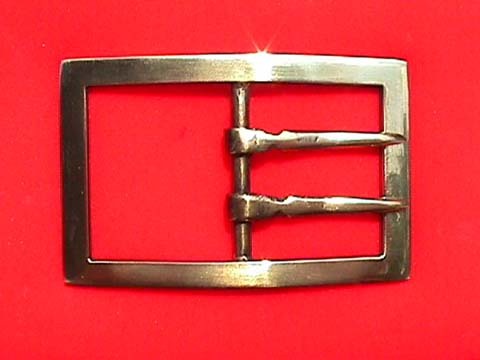 This is a pre-war adjustment buckle worn on the U S two piece belt and the 1832 NCO belt. 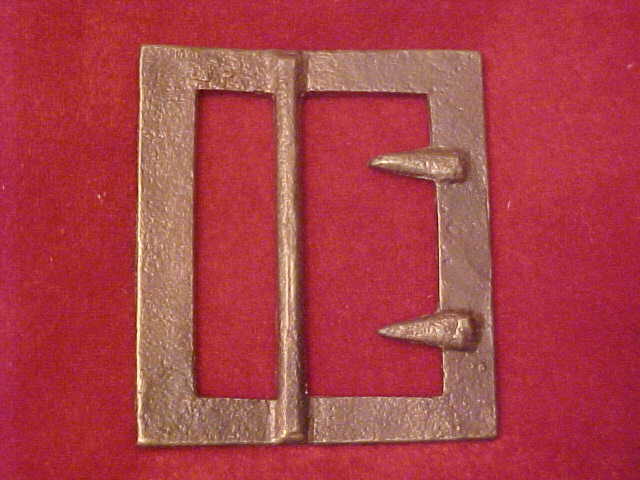 The Confederate in the picture on the left is wearing this buckle. 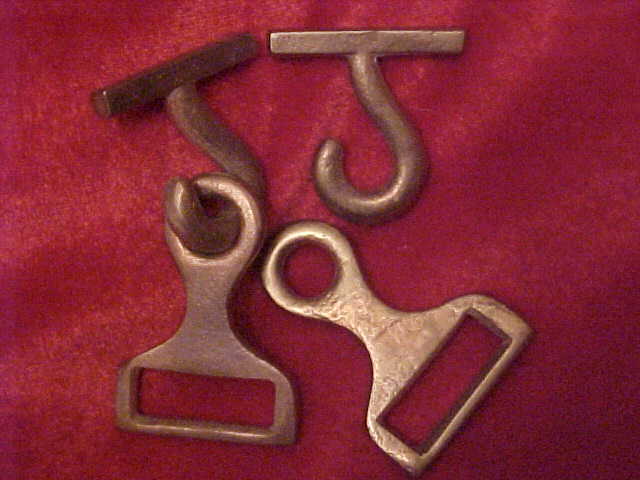 Based on the number I dug from campsites and battlefields these were popular utility buckles for the Confederate soldier. 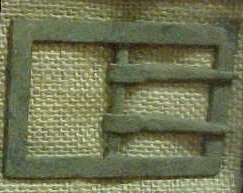 Belt Plate on the right is the same as the above double tongue Frame. The original was dug at Gaines Mill, VA. battlefield. 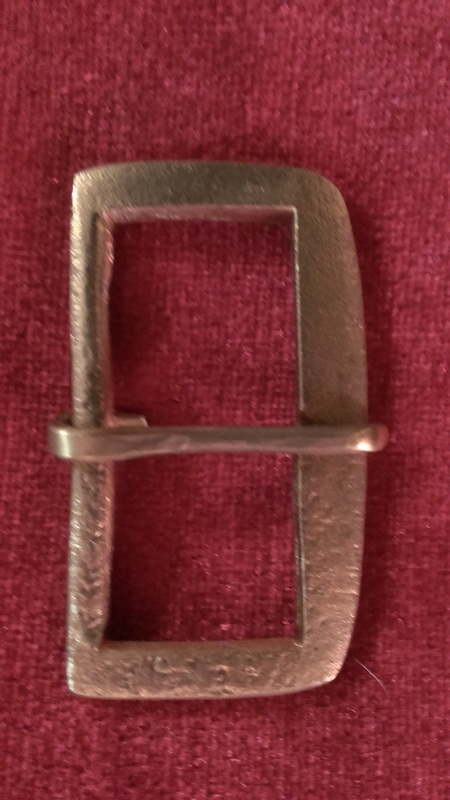 Close up of the adjustment buckle used as a belt plate. 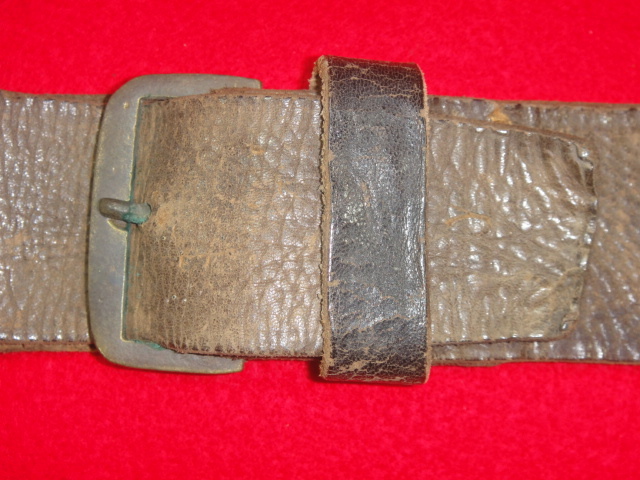 Same as the adjustment buckle on the pre-war 1832 leather belt. 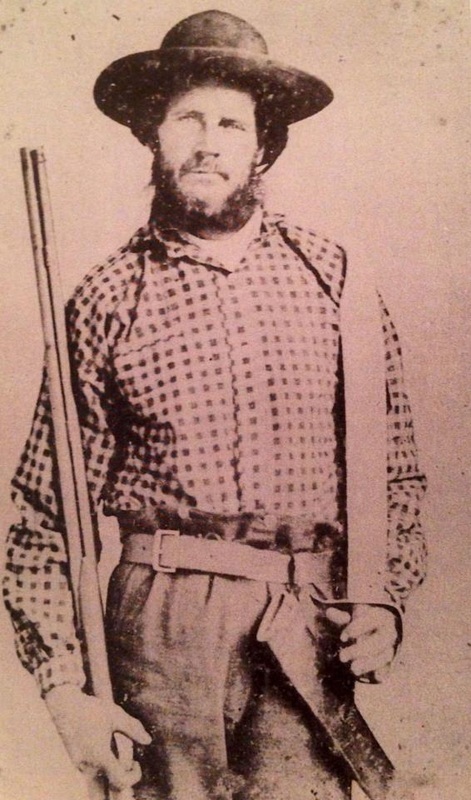 Confederate wearing the McElroy & Hunt belt plate. 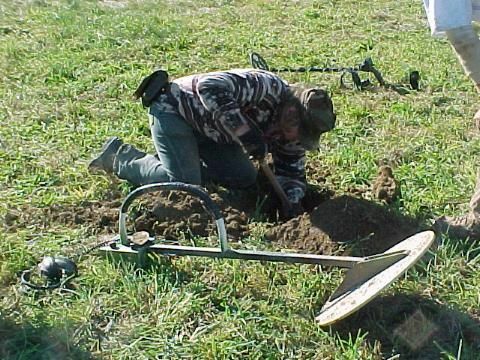 Old time relic hunter Johnny Clements digging a bottle pit at Berekely. 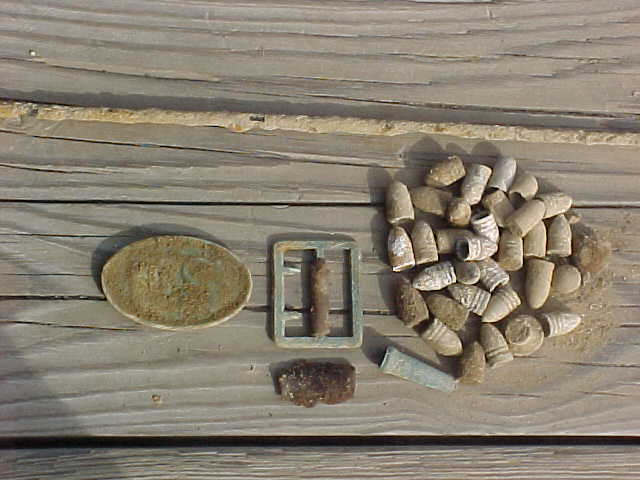 Adams Farm Feb. 2009 I dug from the Confederate trench Enfield bayonet with leather case brass, Springfield bayonet, US buckle, minies and remains of leather cartridge box. 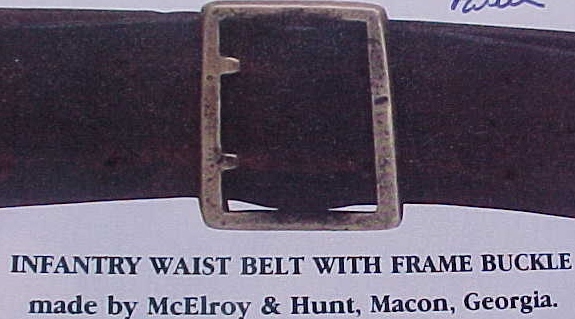 McElroy & Hunt Confederate Frame on the leather belt displayed in The Museum of the Confederacy. Note the mark in the right bar. 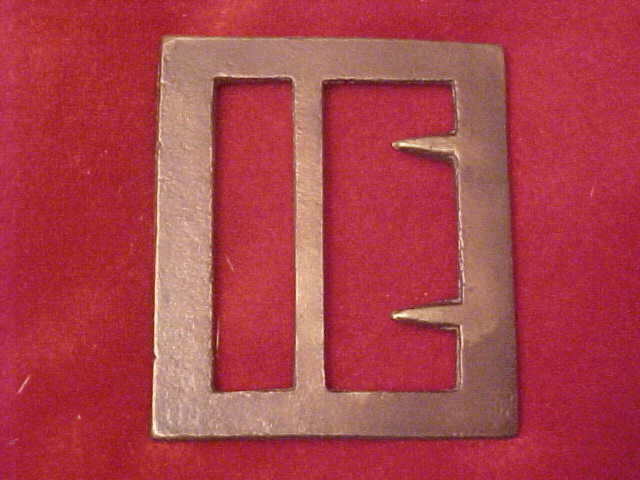 This mark was in the master pattern and will show in all frames cast from this pattern. 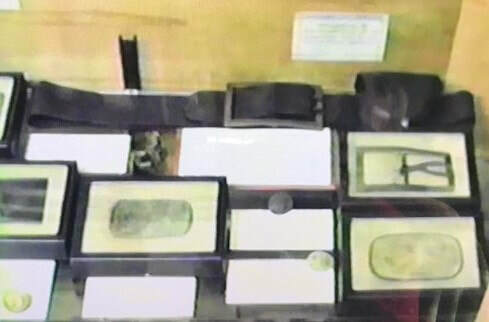 It is wrong for dealers to call all McElroy Frames fake with this mark. I dug my master I use for the pattern and it has the same mark in the right bar. 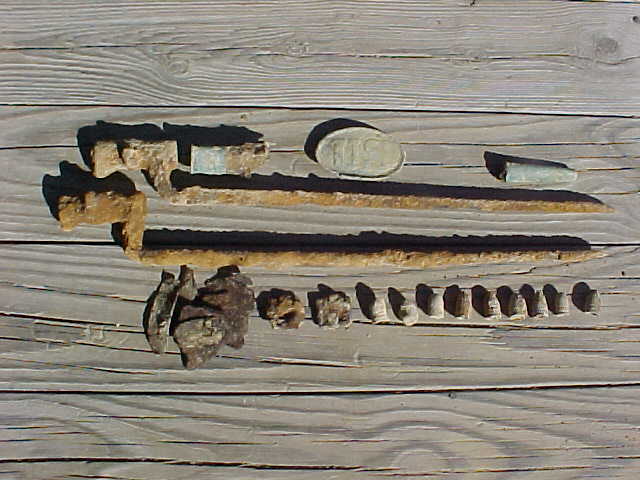 Next day Feb. 2009 Cold Harbor Adams Farm I dug a Confederate Frame buckle and US buckle, ram-rod, many minie balls and burnside cartridge. 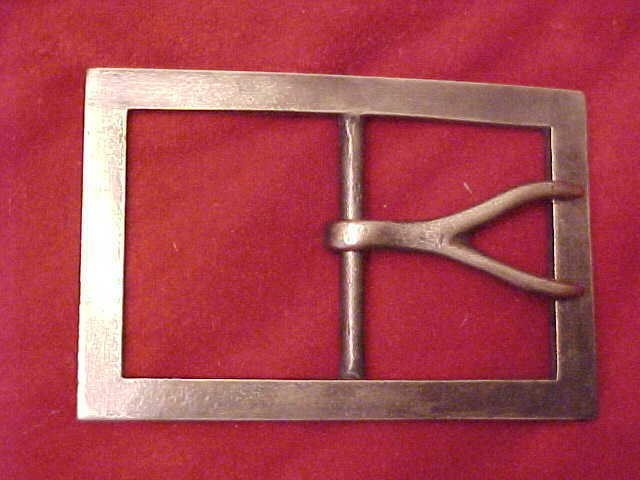 McELROY & HUNT Confederate Frame cast by Hanover Brass (GW) that shows the mark on the right bar. Mr. Adams talking about the Cold Harbor battle on his farm June 3rd 1864. 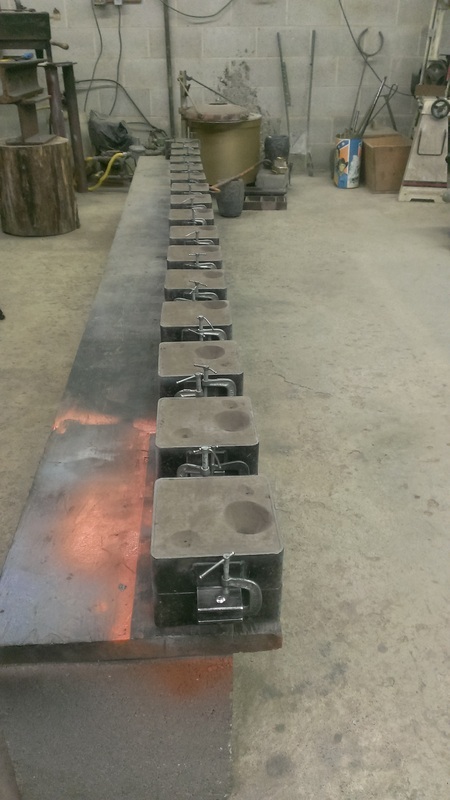 Thirty two buckles in the sand molds ready to pour. All in a days work. 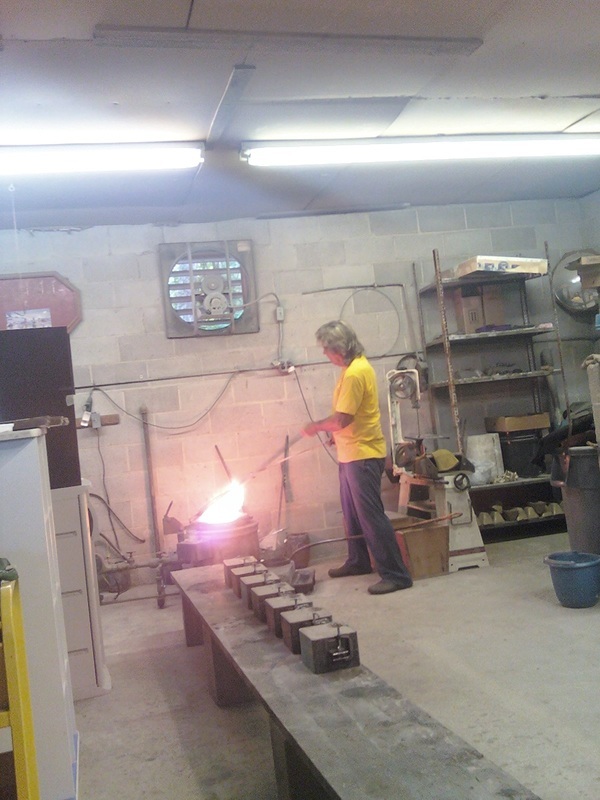 GW melting brass at 2100 degrees to pour these Frame and Forked Tongue belt plates into the sand molds. 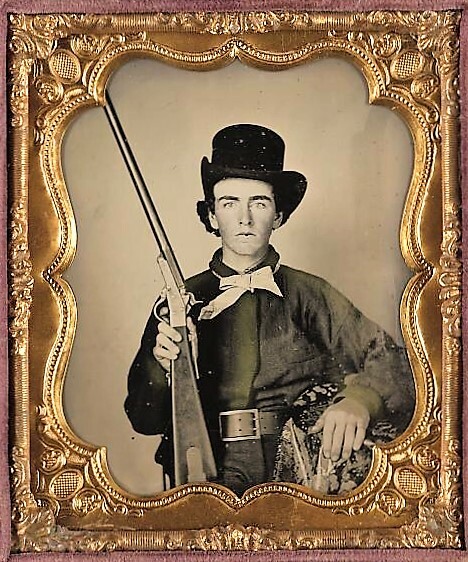 In 1862 and 1864 both Confederate and Union soldiers were entrenched or camped where my home stands today. A few artillery emplacements and confederate trenches still remain. 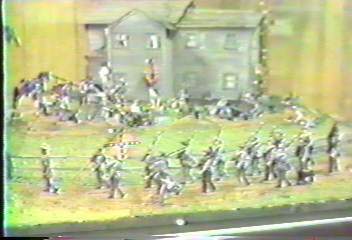 A Marine Officer who visited my Cold Harbor Museum many times built this diarama in 1980's from a photograph of my house as it may have been during the war. 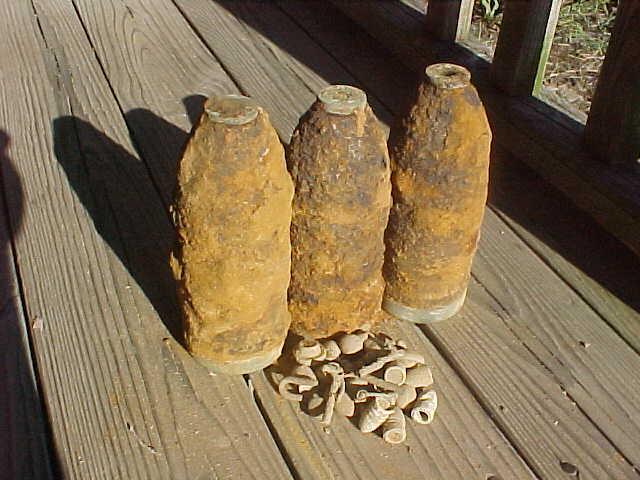 Two pictures on the left and these three Read Shells were the last three days Feb. 2009, Cold Harbor we could relic hunt and dig deep holes in Adams field where the trench line was filled in by Mr. Adams early 1900. No more deep relic holes. 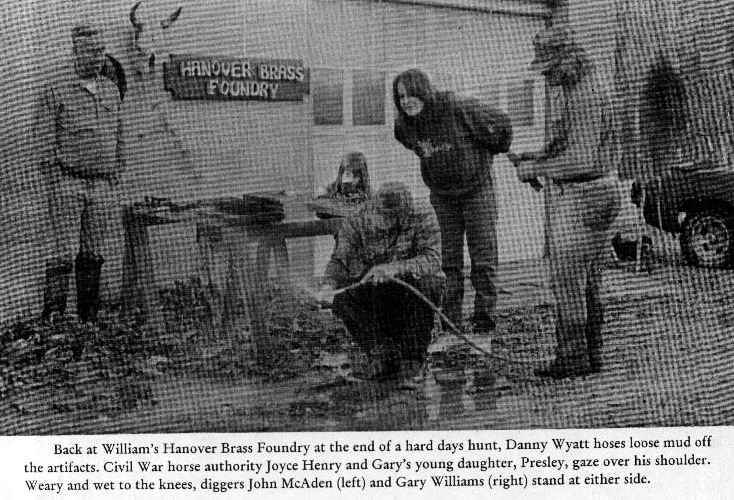 I dug one of my McElroy & Hunt Frame buckles from this field. 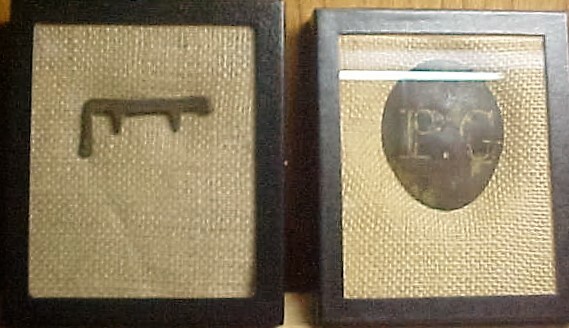 I dug several Frames, one pictured on the left with the U S buckle and lead. Last time I hunted here was Feb. 2009.